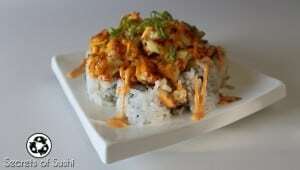 Learn what makes fish Sushi Grade and Why that’s important to know! Sashimi (literally meaning pierced meat) is a term commonly used for raw fish served without rice- though, the fish is not always raw. When you go to a sushi bar and order sashimi, you will typically get between 6-9 pieces of raw (or blanched/brined/smoked) fish- depending on the size of each piece. 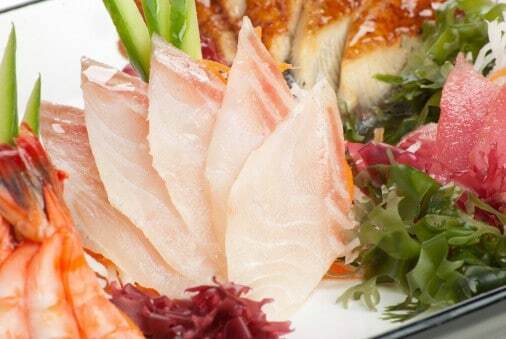 The sushi chef will most likely arrange the sliced fish, very aesthetically, on top of fresh greens or thinly sliced daikon (Japanese radish) and accompanied by wasabi and shoga (pickled ginger). 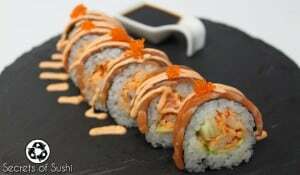 What types of sashimi are not raw? Most types of shrimp, squid, octopus, and eel are either boiled or grilled. Some fish may be smoked, like salmon, while others will be brined or pickled- like mackerel. 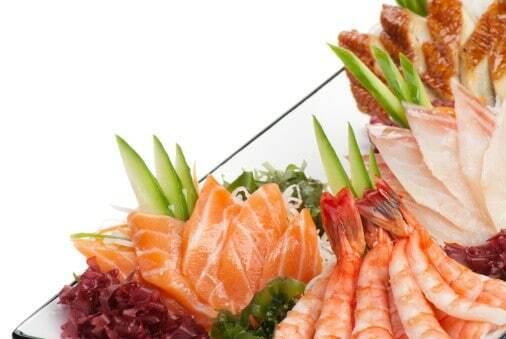 What are the most common types of raw fish? There are several different methods of slicing the fish. This can be done a number of ways, but I usually cut the fish into long strips, about 1cm x 1cm, and then slice the strips into cubes. You can also slice the fish into “chunks”, which is really just any kind of cut that is thicker than a nigiri slice and shaped any way that is consistent. Once you are 1/4 inch from the bottom, fold the partially sliced fish away from the rest and then cut straight down- this make the cut clean and uniform every time. Tataki, translated as “pounded” or “tenderized”, is a term used to define a type of preparation for sashimi. Traditionally, all tataki was coated in ground, or smashed (hence the name) ginger, and then lightly seared at a high temperature. This provided a flavorful crust while maintaining a fresh center. 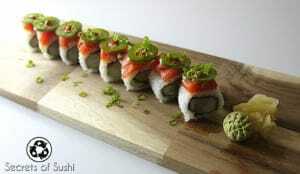 In modern sushi, tataki is prepared using a plethora of different spices. Some of my personal favorite fish to sear using this method is albacore tuna, salmon, and big eye tuna. 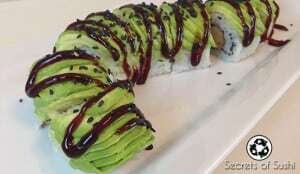 What is considered “sushi grade” fish? 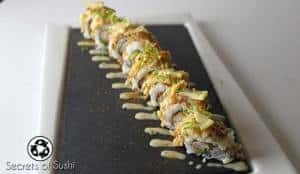 It’s a bit complicated, as the term “sushi grade” is more of a selling point for venders than an actual, defined standard. The FDA requires that raw fish be frozen (usually at -35 degrees Fahrenheit) for a minimum of 15 hours- this is called the parasite eradication process. Usually, when a large fish is caught on a boat and is intended to sell at “sushi grade,” it is immediately killed, gutted, and flash frozen until sold. The supplier (fishermen) sells the fish frozen to the vendor, the vendor inspects each fish and labels it “sushi grade” or not (this process involves checking the eyes, gill coloration, fins, and gut cavity). Then, the vendor sells the fish to a sushi bar (usually on ice, at about 34 degrees) and the head chef or appointed inspector checks the fish again for any deterioration or quality flaws from transit. 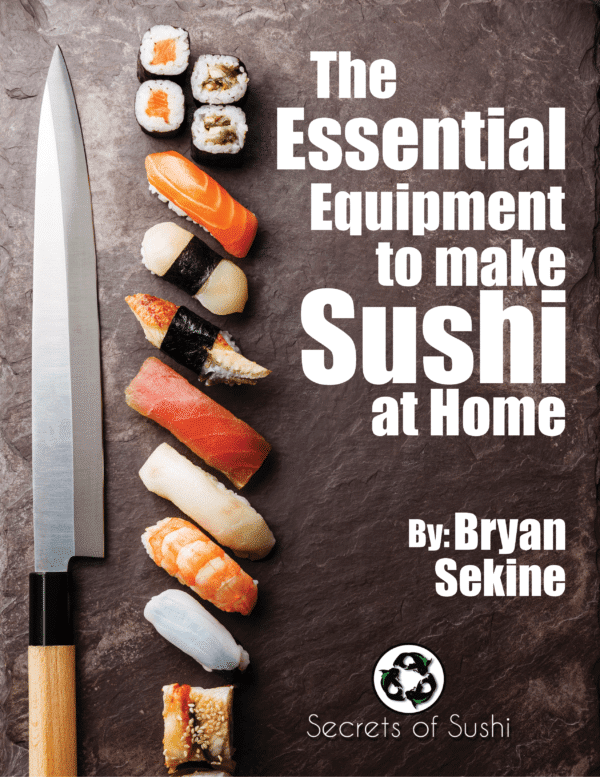 Once the fish is in the hands of the sushi chefs, they portion the fish into smaller sections, freeze what they don’t immediately need, and then thaw one piece at a time (usually each morning a new portion is thawed). However, when buying fish from a market place, the term “sushi grade” has the potential to have absolutely no backing (just like the label “organic”). Always ask the butcher how the fish is processed at the market and what standards they use. When in doubt, freeze any piece of fish for 7 days at -4 degrees Fahrenheit. 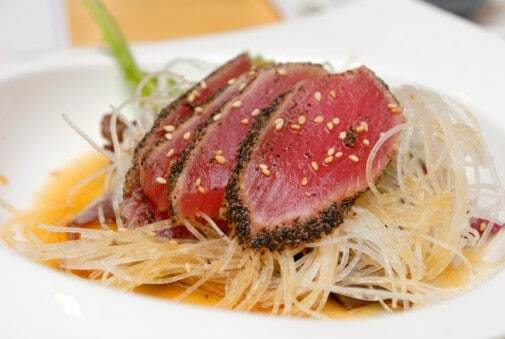 Tataki was actually invented in the 19th century and is not considered to be very traditional at all. 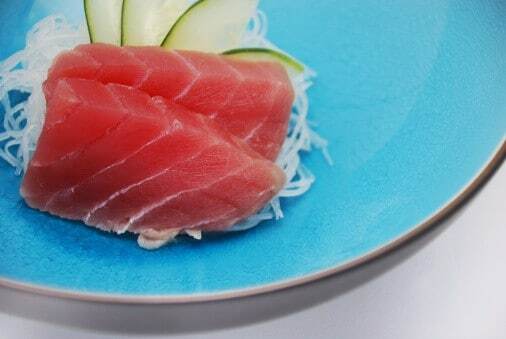 The term sashimi (pierced meat) was coined by the method Japanese fishermen would use to kill the fish- they would catch the fish on a long line, pierce the brain of the fish, and then store it in an ice bath. Killing the fish immediately after catching it reduces the amount of amino acid- which in turn delays most types of decomposition within the fish. This process is known as Ike Jime.